If you’ve started holding menus, books and newspapers at arm’s length so you can read the words, it’s probably time to purchase a pair of reading specs. Reading glasses allow you to see everything with more clarity and focus, including the small print on product labels and books. Thankfully, for less than $15, you get five pairs of high-quality glasses that you can place around your home so that you are never without your sight. Not only are these glasses low-cost, they are also well-made. Let’s take a look at what they have to offer. Whether you are reading a book, playing a game on your tablet or cooking to a recipe, these Gamma Ray reading glasses ensure that you can regain clarity and avoid straining your eyes. The sturdy yet light frames are comfortable for your ears and nose and there are a wide variety of colors that you can choose from to suit your style and face. These glasses are great for anyone who finds that they are struggling to focus on the writing in books, newspapers, labels and menus. They are also ideal if you are prone to breaking, scratching or losing your glasses, as they come in a set of 5 and are very reasonably priced. This set comes with five pairs of glasses including one pair of sun reading glasses that offer UVA and UVB protection for when you are reading outdoors. A microfiber cleaning cloth is also included. The reading glasses are high-quality and durable, allowing you to get a lot of use from them. The frame is made from plastic, which is tough and sturdy. The lenses are non-polarized and plastic, so you don’t need to handle them with too much care.The lens width is available in 52 millimeters and the set comes with five, so you can choose a pair that suits your outfit of the day best. The lens height is 37 millimeters, which will suit most faces. The bridge is 17 millimeters, great for most nose widths and the arms are 135 millimeters, which makes them perfect for those who don’t wear glasses all day but want to keep a pair of glasses handy.These reading glasses are designed to look stylish and can be worn by both men and women. They are brilliant for use at home, in the office or while dining out. These glasses are available with magnifications from 0.50x to 5.00x, so you can find a set that will suit your needs.The plastic frame is so light and comfortable that you may even forget that you are wearing glasses. They also have spring hinges to aid in giving an easier fit.These reading glasses have a two-year manufacturer’s defect warranty from the time you purchase them, so you can rest assured knowing that your eyesight is in good hands. Like most glasses, these are easy to use. Simply find the correct magnification, select from the indoor or outdoor glasses based on where you are or what you are doing, and then put the glasses on so that the arms rest comfortably behind your ears and on your nose. They should feel comfortable and lightweight when wearing them. These eyeglasses have a durable plastic frame as well as non-polarized plastic lenses with a width of 52 millimeters and a height of 28 millimeters. These glasses are suited for men and women with any face shape at any age thanks to the classic shape. The set of five glasses allows you to conveniently keep a pair of specs in different places so you always have access to them. The durable spring hinges make folding and unfolding the arms a breeze. These eyeglasses are very lightweight and comfortable to wear. Plus, their high-quality build for less than $15 (at the time of writing) makes them an absolute steal. If you find yourself pointing at the menu when trying to order or squinting when trying to read a new book, you may need to accept that you need reading specs. Luckily, reading glasses are typically quite inexpensive, like these Gamma Ray Optics glasses. Reading glasses are often treated quite poorly, being thrust into pockets or purses when not in use. This is why a multipack is so great. You can place a pair wherever you find that you need to read something, and even keep a pair in your purse, jacket or car for when you are out and about. These glasses are an ideal solution for anyone looking for high-quality glasses at a fraction of the price that optometrists will charge. How Does Blue Light Damage Your Eyes? What Is Polycarbonate Lens: Are They for You? Some recommended products may use affiliate links. 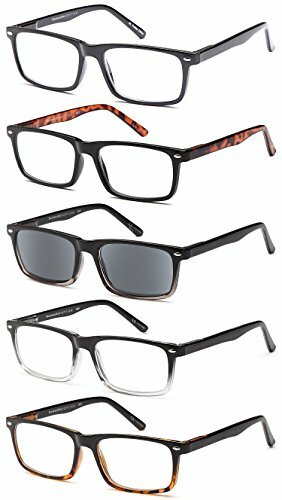 EyesInFrames.com is a participant in the Amazon Services LLC Associates Program, an affiliate advertising program designed to provide a means for sites to earn advertising fees by advertising and linking to Amazon.com. Amazon and the Amazon logo are trademarks of Amazon.com, Inc or its affiliates. Copyright © 2018 Eyes in Frames | All Rights Reserved.